*this is a sponsored post about Royal Design Studio Stencils. All opinions are 100% mine. Here is the before. I almost forgot to get a pic and I thought I didn’t even get one when I was doing the blog post. but I dug and found it! When I was out garage sale-ing this spring in my little town I brought home a darling little leather-look chair. The upholstery is vinyl I think, rather than real leather and it was cracked and worn but was still a very comfortable chair. I passed it up the first time around but text my friend who was selling it later and told her to hold it for me and I’d be by the next day to get it. My plan was to make a slipcover for the chair. And so the chair sat in my living room patiently waiting its turn in the long line of makeovers. A friend suggested leaving it as it was and just putting a cute ruffle around the bottom. I thought that sounded quicker than a slipcover. Then I remembered this stencil I’d been given from Royal Design Studios. I was supposed to be doing a project with it this month. I have a cupboard stashed in my hubby’s garage that I plan to use this stencil on. But I wasn’t getting to that project this month. 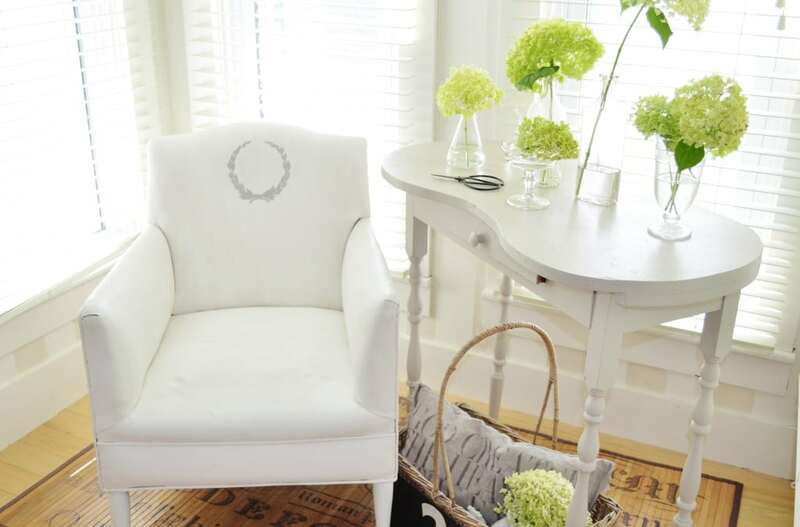 One day while thinking of this cute stencil, the chair caught my eye. And I envisioned the stencil on the chair. Not THAT sounded like a very quick makeover. 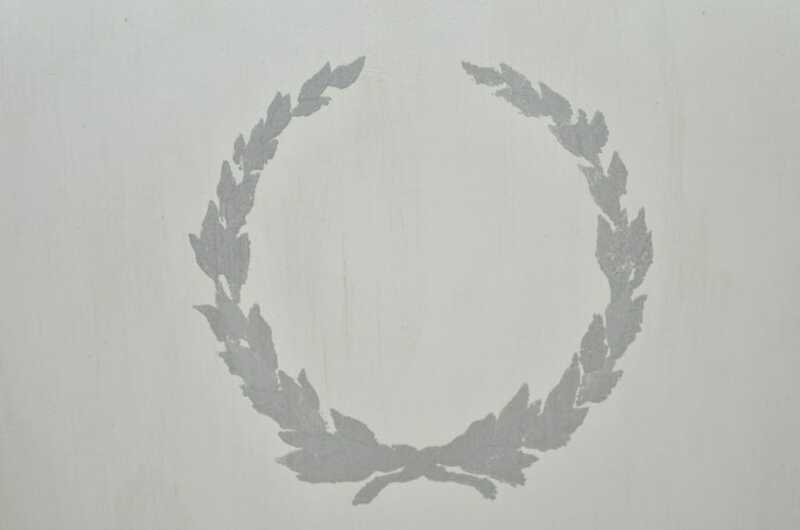 The Small Laurel Wreath Furniture Stencil, I found, is made up of 2 parts. You use #1, let it dry, and then position #2 and paint that one. 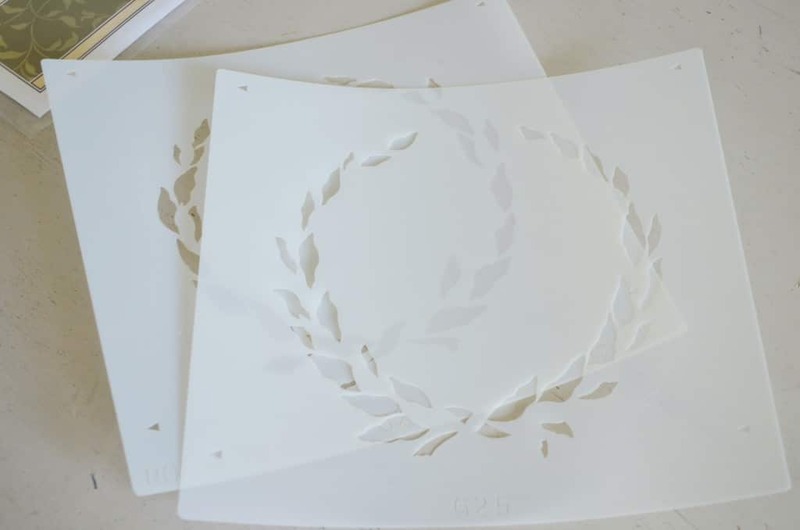 I love laurel wreaths and this one is a wonderful size and I love the fullness of it when both stencils have been painted. At first I was going to just paint on the stencil. Then I decided to spend a bit of time researching painted upholstery. And it wasn’t long before I had decided that Chalk Paint® decorative paint by Annie Sloan would look way different on upholstery than the latex splattered stuff I had seen. Out came the Pure White – I just love this color. I used Paris Grey for the stencil. And for the dipped legs. No I did not actually dip them in paint. It’s just called that. I used my beloved Frog Tape after I had painted the legs white, to tape the line where I wanted the grey to start. I am in love with this chair! I don’t think I can give it up! LOL! I have no room to keep it so it will head to Springfield in September if I don’t sell it before that. I painted the chair, stenciled the chair, painted the grey on the legs, and then I waxed and buffed the whole thing. All of it. 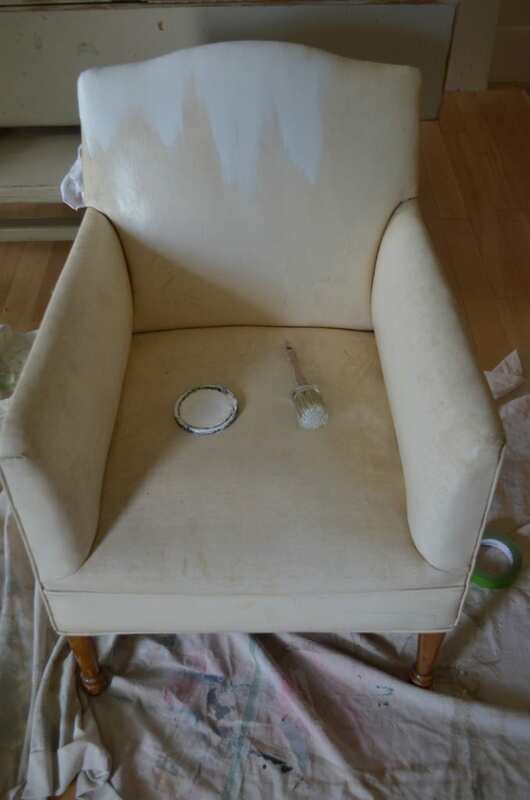 I wish I could find the blog I read about painting and waxing velvet upholstery. The technique they used was cool and they said it looked and felt like old leather. For some reason I don’t seem to have bookmarked the post 🙁 I’ll have to dig around and try to find it again and see if perhaps I was smart enough to at least pin it. I can’t remember. I was too excited to get started on my chair and see the finished result I guess! 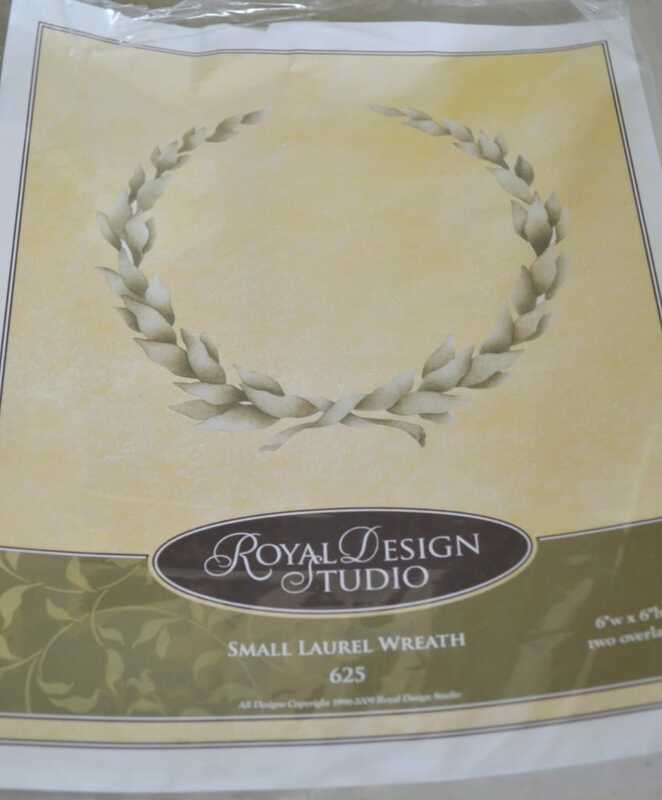 If you would like to do some projects that include stencils I highly recommend Royal Design Studio. They provided the stencil to me for free, but the opinions about their products are all mine. I won a giveaway on a friends blog several months ago and was very excited with the selection of stencils they had. You can see the stencils I picked here. You can see other projects I did with those stencils here, here, here, and here. I loved the projects I did with the other stencils, so when I was contacted about doing more projects with some stencils from them I was delighted. I picked 2 stencils I liked and they sent me both of them! The other one is a wall stencil and has turned into a much bigger project but I hope to have it finished up to at least start sharing it with you in a couple of weeks. So if you like stencils, or if you would like to get a whole new attitude about stencils go check out all the great stuff Royal Design has to offer. (stencils are much more than geese, hearts, and flowers 😀 ) You can do so much with stencils – think outside the ’80’s box! 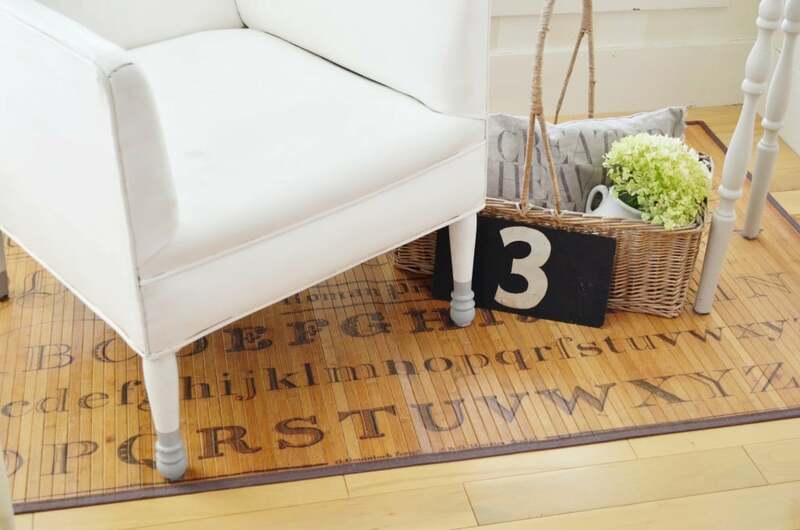 Have you used stencils lately? Would you like to? What project would you do with a stencil? That is the prettiest vignette!! Creative idea to paint and stencil the chair, it looks so unique! Love this chair! I have not heard of waxing over fabric upholstery. I would love to know what wax product you used? Is it just paste wax or is there a different type? I have tried painting a vinyl chair, but it didn’t turn out nearly as nice as yours. Yes, I did use latex paint. I painted several coats on it, but it just never covered it very well. Did you use a primer under the chalk paint? I used one coat of Annie Sloan chalk paint then waxed with Annie Sloan’s soft wax in clear. Buffed it almost immediately after waxing. I have seen some tutorials for using latex paint and they say to thin the paint with water first. Might work better that way? With Annie Sloan paint you don’t need to prime first. 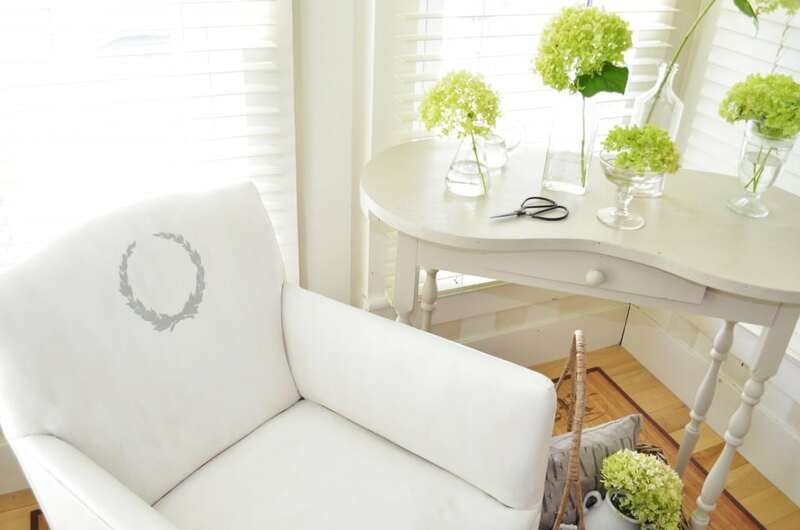 I didn’t even think that something was missing from that pretty chair until I saw the stencil on it-perfect! 🙂 I am loving this stencil so much! Must use it on something else soon! Love it! Thanks so much for the tips and ideas on painting a chair like this! I’ll be featuring your chair on Tuesday at my Twirl & Take a Bow Party. Stop by and see! love it.. as usual.. but I wanna see a before pic of the chair =) I can’t imagine painting vinyl.. so I’m wondering what the chair looked like to begin with?! I added the before pic so go check it out again! Or come by tomorrow – new post with a before and after. Wow, what a great idea! The chair looks lovely! Thanks Marty! Maybe I’ll have time to catch your party next week! Thanks for telling me aobut it! Hi Carrie! So glad you came by!! You would love this stencil! I may be doing a giveaway for some stencils in the future so stay tuned! Thanks Daniela – and i’m sure yours will turn out great too. I think the water thing is a good way to do with any paint for upholstery. And I know with mine it was the wax finish that really made it awesome! Make sure you share pics! Great job – love the inventiveness – but no BEFORE picture! 🙁 Enhances the project that much more! Tracie – I just added a before pic today. When I did the post I didn’t think I had a before pic – then I dug a little and found one I snapped right after I had started painting. It shows what the chair looked like before so come back and check it out! I so love this! Never had a clue about chalk paint! I love Annie Sloan’s products, but think I’ll try my DIY chalk paint, for cost effectiveness. What I’d like to know is how does it “Feel” to sit on? It feels just like a leather chair! The wax makes a wonderful finish. I can’t wait to do this on fabric instead of just vinyl. Jill, thanks so much for the ‘before’ pic. See – shows you great eye. Looks great now!! 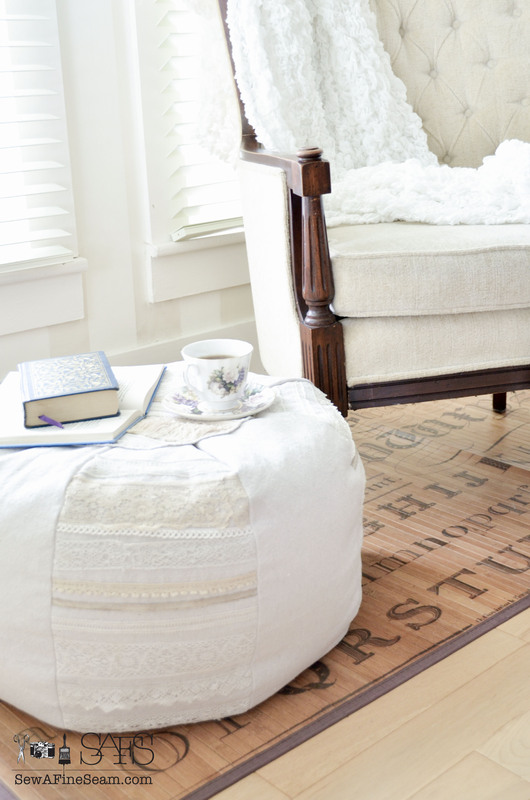 wow, what a great idea, I love the look, and the laurel stencil is the icing on the cake! Thank you Debra – this project was a lot of fun! Wow! your chair turned out so nice! Love the colours you chose…and adding the stencil was a really smart idea! 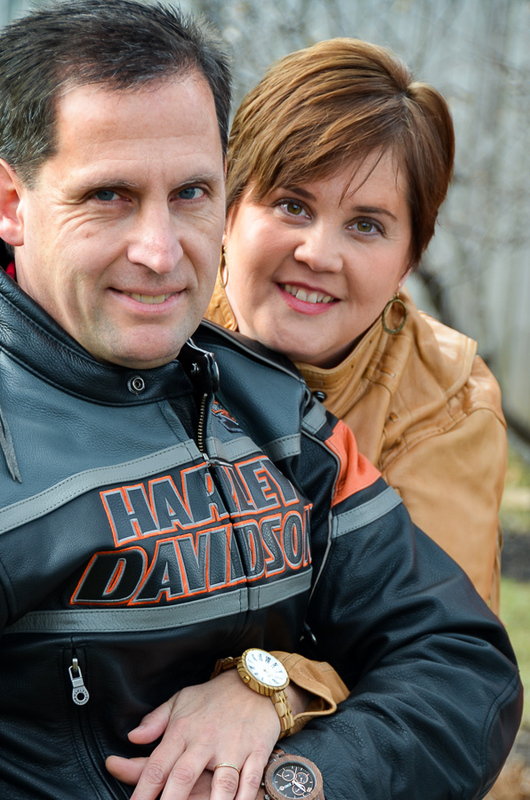 Thank you Kelly – I love the end result so much! Hi Jill, I don’t do a lot of refinishing because of my health, but when I saw this at MMS’s FFF, I HAD to ask you something! I have 2 very old, but very comfortable, kitchen chairs. I painted the legs-but the way they’re put together, the “simple” redoing the vinyl with fabric would be MUCH more complicated than I originally thought. NOW, you’ve given me this idea, however, I must ask about “wear”. These chairs would be used several times a week, and I don’t want anyone complaining about getting “wax” or paint on their pants? Does the wax soak in enough and does the paint “grab” the vinyl, (also more like a fake leather), enough to be used frequently? Is there anything more I can do to make sure it’s “sit-proof”? Thanks in advance! These 1960’s mustard-colored chairs just don’t fit with the rest of my furniture! 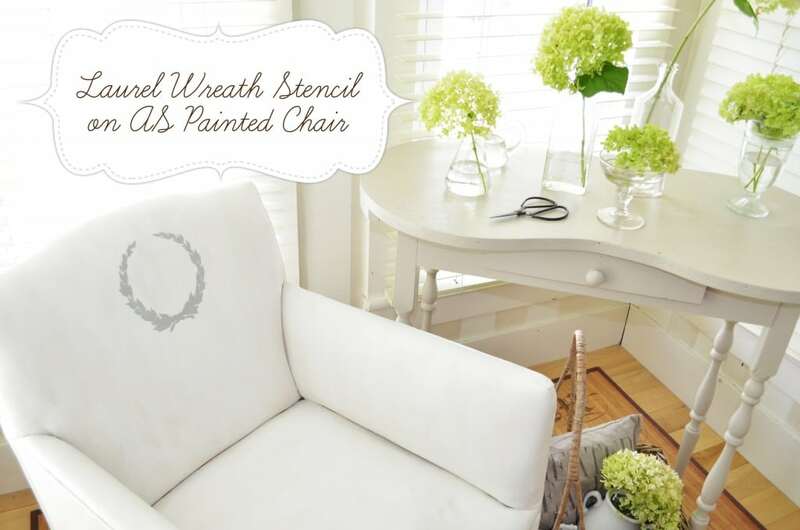 Annie Sloan chalk paint adheres to almost any surface. It worked GREAT on this one. And the wax was buffed immediately after I put it on so it buffed really easy and really well. I did one coat of wax on the whole chair, buffed, applied another coat of wax, and buffed again. I love the finish. It is smooth, has not got tacky or sticky at all even though we have had our windows open and it has been rather humid some days. My girls have sat in it, jumped on it, bounced in it and I do not see any cracking yet. It can crack some like an old bomber jacket will but I don’t think the vinyl is as likely to do that as a piece of painted furniture that was originally an upholstered fabric instead of a smoother vinyl if you get what I’m saying! Also – I have a harvest table and 2 benches that we have had for years. They were painted and finished with a minwax brand wax. The wax has never come off on clothing and we use the benches every day. Annie Sloans wax is a much better wax in my opinion and when buffed properly I cannot imagine it coming off on clothing. If the thought of using wax still scares you a bit you can put a clear sealer of some sort on the paint instead. A water based poly would work or I think Annie Sloan has a sealer now that works well for things you don’t want to wax. I hope this helps you and if you have any more questions please don’t hesitate to ask! Thank you So Much!! I will be price-shopping for some ASCP as soon as I get settled today, (been in ER, my unfortunate, “home away from home”, see note below!. Note: I also have been thinking of some way I could help a “friend”, (actually, my long-time Doc, also a friend & in charge of a very small local hospital-as in hospital census normally under 15 :). Our ER here, or rather the waiting room, (which is also the waiting room for lab/X-ray/etc), has 30 year old, dulled, just VERY UGLY, (only way to put it), vinyl chairs. They’re “worn”, but not torn, formally with a floral pattern, now just kind of blurry grey/blue/brown. The vinyl itself MUST be a “high” quality, as they don’t even feel “worn”, or thinned out in any places. (With 2 exceptions of single chairs with tears in the corner). I’ve been talking to him about them for a year or so, and even priced replacements and even re-upholstering them-neither of which he said was “doable” right now. The ladies auxiliary and the local high school and churches have had fundraisers, but it usually goes towards equipment-not aesthetics. I’m going to cann the auxiliary tomorrow and see what they think about this idea!! If it lasts through children, well, that’s the test for wearability/durability! I’ll forward this blog address to them and Doc D. 😉 he’s going to think I’m nuts talking about “painting” vinyl chairs, but I’ll refer him here! I may have to see if we can get a deal on the chalk paint and wax though. When I was pricing for reupholstering, it was for 10 wide single chairs, 10 doubles and 5 triples. That’s a LOT of paint & wax, but still cheaper than the other alternatives. Just one more request: you mentioned painting over fabric chairs? Is there somewhere I could find out more about this? Or is it the same process? It turned out great. Love the added stencil. That’s not the one I found earlier, I did find it again, but that one is a great one too! Thanks so much! Being in the vinyl upholstery business, it is new for me to see people actually painting their furniture. Your finished project looks great and my wife was adoring the entire room you have set up. Well I’m sure you could make it look even better with a new upholstery job but it was a fun quick fix for an old piece! Tell your wife thanks for the compliment! Hi Jill, your chair looks lovely! I’llbe trying this very soon! Is this the painted velvet post you were referring to? This is gorgeous! I am curious on how durable it would be. I have a faux leather ottoman that could use a makeover. The problem is my dog likes to act like a cat and lay on it to look out the window. Still, I may just have to try painting it and see what happens! Hi Katie – I think paint on vinyl would hold up very well. Other bloggers I’ve seen do this have raved about it. I waxed it and buffed it good and I relaly think the finish will last just as well as it would on a piece of wood furniture! I was wondering how the chair is holding up. Do you have cracking or chipping issues?